UPDATE: Head over to Tara Bennett's (the article author) blog and The Hob for additional quotes from the article. The full feature will be available in Sci Fi magazine's December 2013 issue, arriving on US newsstands, and everywhere online this week. Go and grab a copy! 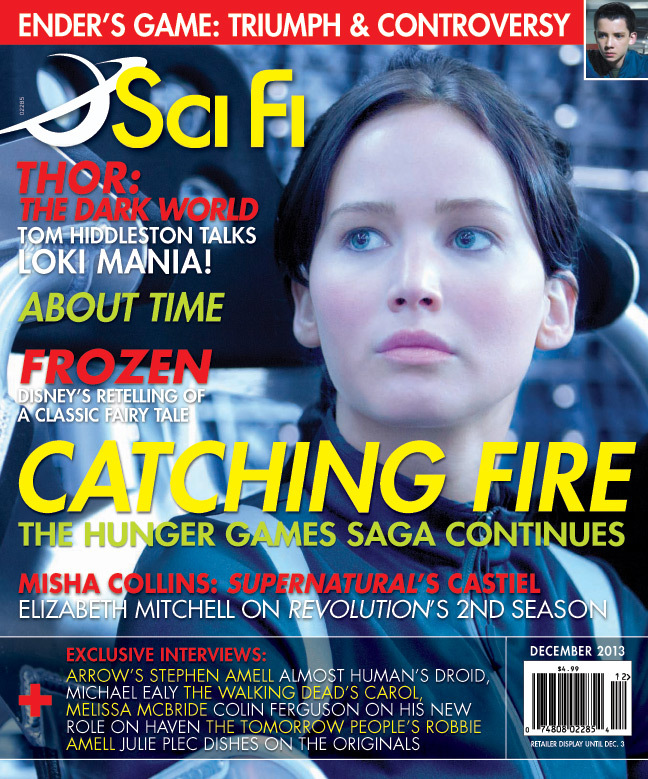 Sci Fi magazine's Catching Fire feature has arrived! Included in their December 2013 issue are exclusive quotes from director Francis Lawrence, and our Johanna, Jena Malone. Walking into a breathtaking suite in the Casa del Mar, where director Francis Lawrence awaits, the press machine is officially kicking into high gear for his first installment of The Hunger Games films, Catching Fire. In the sequel, Katniss Everdeen (Jennifer Lawrence) and Peeta Mellark (Josh Hutcherson) are back in District 12 after winning hte Hunger Games, estranged, dealing with PTSD and the ripple of dissension they created with their unorthodox win over the Capitol and President Snow (Donald Sutherland). As they embark on a Victory Tour, the spark of rebellion will rise around them and ultimately thrust them both back into the Games with other former winners as punishment. "I had never planned on doing a sequel to anything where there is an established world, but part of what I saw in Catching Fire was a large opportunity to create and not just have to go back," he admits. "This story for me is where everything starts to take off. The characters are very different because they are changed by the games. The world is very different. It's winter in District 12 and we see different parts of it like the Victor's Village. We also go to districts we haven't been to before. The Arena is completely different. I thought there was an opportunity to humanize Effie (Elizabeth Banks) and Haymitch (Woody Harrelson), as well as the opportunity to add new cast." "So there was plenty of opportunity for world building, which is something I like to do, but I loved where the story went. I love that the stakes were ratcheted up for the world and I liked where the love triangle started to go"
"In Catching Fire, the emotional core of the film revolves around Katniss transitioning from just being a single-minded survivalist as she tries to sort out her attachments to both long-time friend, Gale Hawthorne (Liam Hemsworth) and Peeta." Lawrence explains, “we see what each of the boys represents for her: the eloquence and peace of Peeta and the rebellion and fight in Gale. How they weigh with Katniss is getting set up here and is so important for the next movie." "The hardest part for me was shooting in Atlanta, because I was still discovering Johanna and I had a hard time breaking out of her on set. I felt like I was more of a loner, not going out and hanging out with everyone because I just wanted to get her right. I feel like once we got to Hawaii, I knew who she was and could let my shoulders down a bit and realize I'm on a beautiful location and I started hanging out with the cast and crew more. They were like, "Oh Jena, you're normal and not a crazy person like Johanna," Locations helped to put me at ease a little. I think the relationship between Finnick and Johanna is so important that any little moment we have together we went for it because they are sole survivors. They've grown up together and I think they've bonded because of that. I think it's one of the last beautiful relationships in Johanna's life where it's someone she can actually rely on. There's a scene with Stanley Tucci (Caesar Flickerman) that I was a little bit nervous about because I hadn't seen him before, as he was in makeup so we didn't get to talk, but we had worked together before. I literally got up on stage and said, "Hey Stanley, it's nice to see you again," and we started the scene where I basically have to vomit my crazy aggression all over him. Afterward, as he's wiping the spit from his eye, he was like, "Thank you, Jena. That was actually great," so I was like, "Yes!" We haven't quite managed to see everything from the feature yet, so stay tuned for more! Thanks to hawthornhedge and readingperks.